Marines are known for being always faithful; for never giving up; for being hard-chargers. Perhaps no Marine better exemplified these traits than Lewis "Chesty" Puller, the most decorated Marine in the history of the Corps and the only American serviceman to have been awarded the nation's second-highest military awards for valor six times. Lewis "Chesty" Puller was born in West Point, Virginia, on June 26, 1898 to Matthew and Martha Puller. Puller grew up listening to Civil War veterans telling stories of their time in the war, and Thomas "Stonewall" Jackson was young Lewis' idol. In 1916, he tried to enlist in the U.S. Army to fight in the Border War with Mexico, but he was too young to enlist and his mother did not give her consent to allow him to join the Army. In 1917, Puller began attending the Virginia Military Institute, but left the school in 1918 to enlist in the Marine Corps, hoping, but not achieving, his goal of seeing action in World War I. Following the conclusion of World War I, then-Corporal Puller received orders to serve in Haiti as a lieutenant training the newly formed Gendarmerie d'Haiti, a constabulary force that consisted of Haitian enlisted personnel and Marine officers. Puller served in this capacity from 1919-1924, at which time he returned to the United States and received his commission as a second lieutenant. After completing assignments at the Marine Barracks in Norfolk, Virginia, The Basic School in Quantico, Virginia, and with the 10th Marine Artillery Regiment in Quantico, Virginia, Puller was assigned to the Marine Barracks at Pearl Harbor, Hawaii, in 1926, where he served for two years before being assigned to San Diego, California, in 1928. In December of 1928, Puller was sent to Nicaragua to serve with the Nicaraguan National Guard detachment fighting rebels led by Augusto Sandino. During his time in Nicaragua, Puller would earn the first of his five Navy Crosses for his actions from February 16 to August 19, 1930, when he led "five successive engagements against superior numbers of armed bandit forces." Puller returned to the United States in 1931 and completed the year-long Company Officers Course at Fort Benning, Georgia. After completing the course, Puller returned to Nicaragua in late 1932, where he earned a second Navy Cross for leading American Marines and Nicaraguan National Guardsmen into battle against Sandinista rebels in the last major battle of the Sandino Rebellion near El Sauce on December 26, 1932. Following his time in Nicaragua, Puller was assigned to the Marine detachment in Beijing, China, where he commanded a unit of "China Marines" (U.S. Marines stationed in China). After serving in China, Puller served aboard USS Augusta, a cruiser in the Asiatic Fleet that was commanded at the time by then-Captain Chester W. Nimitz. Puller returned to the States in June 1936 to serve as an instructor at the Basic School in Philadelphia before returning to the Augusta in 1939 as commander of the on-board Marine detachment. Puller and his Marines on the Augusta sailed to China, disembarking in Shanghai in May of 1940. While in China for the second time, Puller served as the executive officer and commanding officer of 2nd Battalion, 4th Marines (2/4) until August 1941. Then-Major Puller returned to the United States later that month and, after a short leave, he was given command of 1st Battalion, 7th Marines (1/7) of the 1st Marine Division, stationed at New River, North Carolina (later Camp Lejeune). During the early days of World War II in the Pacific Theater, Puller's 7th Marines formed the core of the newly-created 3rd Marine Brigade and the battalion arrived in Samoa to defend the island from Japanese forces in early May of 1942. Later that summer, the 7th Marines were redeployed from the brigade and in early September, they left Samoa, rejoining the 1st Division at Guadalcanal later that month. Shortly after arriving on Guadalcanal, Puller led his battalion in fierce fighting along the Matanikau River. During the engagement, three of Puller's companies were surrounded and cut off from American forces by Japanese troops. Puller ran to the shore, signaled a U.S. Navy destroyer, the USS Monssen, and directed the ship to provide covering fire while landing craft rescued the surrounded Marines. During the rescue, U.S. Coast Guard Signalman First Class Douglas Albert Munro, Officer-in-Charge of the group of landing craft, was killed while providing covering fire for the Marines and was posthumously awarded the Medal of Honor for his actions, making him the first, and to date the only, Coast Guardsman to receive the decoration. Puller's quick thinking in organizing the rescue saved the three companies and earned Puller the Bronze Star with Combat "V". Later on Guadalcanal, Puller earned his third Navy Cross in what was later known as the "Battle for Henderson Field". During the engagement, Puller commanded 1st Battalion 7th (1/7) Marines who, alongside the 3rd Battalion of the U.S. Army's 164th Infantry Regiment (3/164), defended Henderson airfield against a regiment-strength Japanese force. In a firefight that lasted more than three hours on the night of October 24-25, 1942, the 1/7 and 3/164 sustained 70 casualties while the Japanese suffered more than 1,400 troops killed in action and the Americans held the airfield. For their actions during the battle, Puller nominated two of his men (one of whom was Sergeant John Basilone), for Medals of Honor. Just over two weeks later, on November 9, Puller was wounded himself. Following his time on Guadalcanal, Puller was made the executive officer of the 7th Marine Regiment. While serving in this capacity at Cape Gloucester, New Guinea, Puller was awarded his fourth Navy Cross for overall performance of duty between late December 1943, and mid-January 1944. Puller was then promoted to colonel effective February 1, 1944 and by the end of the month, he had been named commander of the 1st Marine Regiment. In September and October of 1944, Puller led the 1st Marine Regiment in the battle of Peleliu, one of the bloodiest battles in Marine Corps history, and received the first of his two Legion of Merit awards. In November of 1944, Puller returned to the United States and was named executive officer of the Infantry Training Regiment at Camp Lejeune, North Carolina and, less than a month later, was named Commanding Officer. After the conclusion of WWII, Puller was made Director of the 8th Reserve District at New Orleans, Louisiana and later commanded the Marine Barracks at Pearl Harbor, Hawaii. When the Korean War broke out, Puller was once again assigned as the commander of the First Marine Regiment. On September 15, 1950, Puller and his Marines took part in the landing at Inchon, for which Puller was awarded the Silver Star. For his overall leadership from September 15-November 2, 1950, Puller was awarded his second Legion of Merit award. Puller was awarded the Distinguished Service Cross by the U.S. Army for heroism in action from November 29 to December 4, and he received his fifth Navy Cross for heroism for his actions during the Battle of the Chosin Reservoir from December 5-10, 1950. It was during the Battle of the Chosin Reservoir that Puller uttered the famous quote, "We've been looking for the enemy for some time now. We've finally found him. We're surrounded. That simplifies things." In January of 1951, Puller was promoted to the rank of brigadier general and was assigned to serve as the assistant division commander (ADC) of the 1st Marine Division. In late February of that year, Puller's immediate supervisor, Major General O.P. Smith, was transferred to command IX Corps when its commander, Army Major General Bryant Moore, died, leaving Puller in temporary command of the 1st Marine Division until March. Puller completed his tour of duty as assistant commander and left Korea to return to the United States in late May. Upon his return from Korea, Puller took command of the 3rd Marine Division at Camp Pendleton, California until January of 1952, and he then served as the assistant commander of the division until June 1952. Puller then took over Troop Training Unit Pacific at Coronado, California. In September 1953, he was promoted to major general. In July of 1954, Puller assumed command of the 2nd Marine Division at Camp Lejeune, North Carolina until February 1955 when he became Deputy Camp Commander. In 1955, Puller suffered a stroke and was retired by the Marine Corps on November 1, 1955. 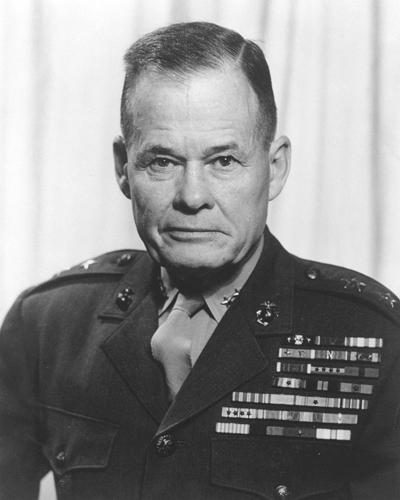 Following his death in 1971, Puller was posthumously promoted to lieutenant general. Through his decades of service and fearless leadership, Lewis "Chesty" Puller cemented his status as a Marine Corps icon. In addition to his many awards, Puller received numerous additional honors, including having the frigate Lewis B. Puller (FFG-23), the headquarters building for 2nd Fleet Antiterrorism Security Team on Yorktown Naval Weapons Station in Yorktown, Virginia, and Route 33 in Middlesex County, Virginia, named after him. In November of 2005, the United States Postal Service issued its Distinguished Marines stamps in which Puller was honored along with Daniel J. Daly, John Basilone, and John A. Lejeune. In 2012, Military Sealift Command announced that a Mobile Landing Platform was to be named after Puller, being designated as USNS Lewis B. Puller (T-MLP-3/T-AFSB-1). The former Marine Barracks Pearl Harbor, Hawaii Officers' Quarters, includes a historic home affectionately known as the "Chesty Puller House," in honor of Puller who lived there from 1948 to 1950. Additionally, the Marine Corps' mascot is perpetually named "Chesty Pullerton." (e.g. Chesty XIII). He is always a purebred English Bulldog. 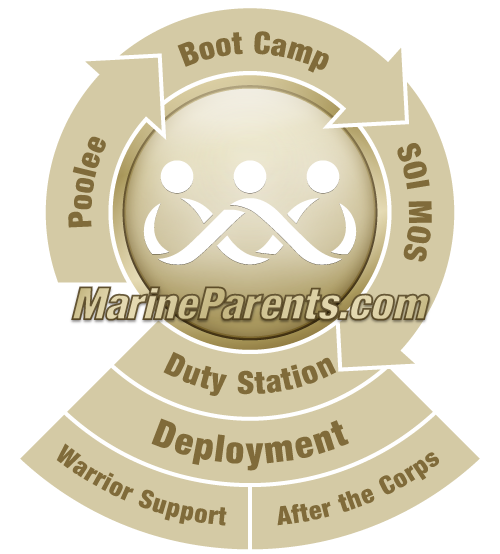 Common sayings during Marine Corps boot camp include ending one's by saying, "Good night, Chesty Puller, wherever you are!" Another common encouragement is "Chesty Puller never quit!" In both boot camp and Officer Candidates School cadences, Marines chant "It was good for Chesty Puller/And it's good enough for me," as well as "Tell Chesty Puller I did my best." Recruits also sing "Chesty Puller was a good Marine and a good Marine was he." While doing pull-ups, Marines sometimes encourage each other to "do one for Chesty!" Each year, Marine Corps Detachment from Fort Lee, Virginia, runs 66 miles from Fort Lee to Pullers grave at Christ Church cemetery in Saluda, Virginia in Puller's honor. —Lewis "Chesty" Puller (USMC photo/released). 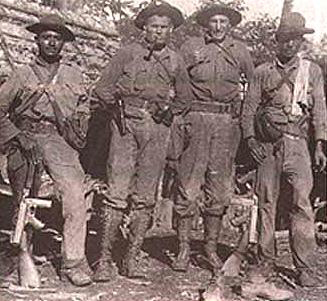 —First Lieutenant Lewis "Chesty" Puller (center left) and Sergeant William "Ironman" Lee (center right) and two Nicaraguan soldiers in 1931 (USMC photo/released). —Lieutenant Colonel Lewis B. 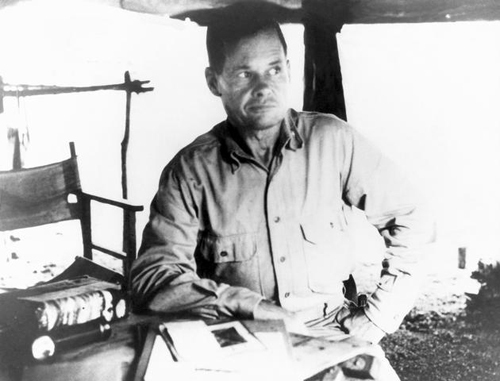 "Chesty" Puller, USMC, Commanding Officer of 1st Battalion, 7th Marine Regiment at Guadalcanal (USMC photo September, 1942/released). 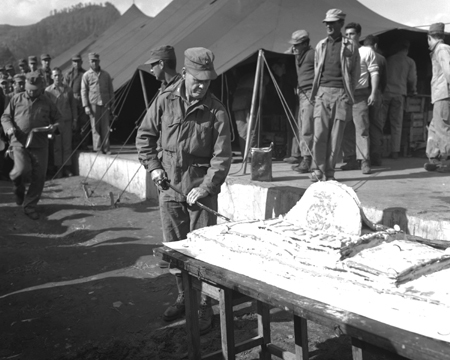 —Then-Colonel Lewis "Chesty" Puller cuts the Marine Corps birthday cake 10 November 1950, during a brief reprieve in battle during the Korean War (Official Department of Defense photo/released). 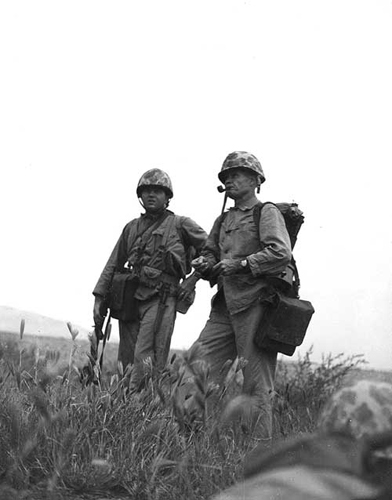 —Marine Colonel Lewis "Chesty" Puller, right, who distinguished himself during the Inchon landing, studies the terrain before advancing to another enemy objective beyond Inchon (USMC photo by Staff Sergeant M. Shutak). 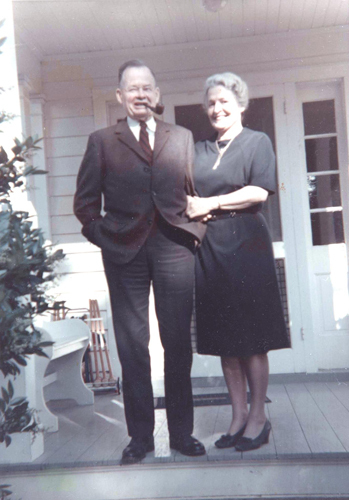 —Then-retired Lewis "Chesty" Puller and his wife, Virginia, at their home (Image courtesy of USMC Archives and Special Collections). 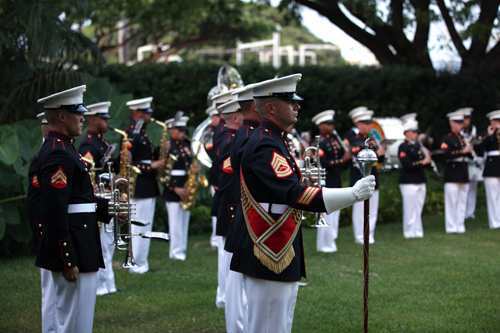 —Gunnery Sergeant Brad Rehrig, Drum Major for the U.S. Marine Corps Forces, Pacific Band, stands in position during the centennial ceremony for the "Chesty Puller House" at Joint Base Pearl Harbor–Hickam, Hawaii, September 15, 2013. Lieutenant General Terry G. Robling, commander of Marine Forces Pacific and his wife, Cathe Robling, hosted the ceremony as a way to honor historic neighborhood. (USMC photo by Private First Class Erik Estrada). —Lieutenant Colonel Thomas H. Gilley IV, USMC Detachment Fort Lee commanding officer; and Master Gunnery Sgt. Tony C. Smith, Marine Corps Food Service School staff noncommissioned officer in charge; lead a formation of more than 300 Marines through the town of Saluda, Virginia, October 24, 2014, for the 21st annual Chesty Run. 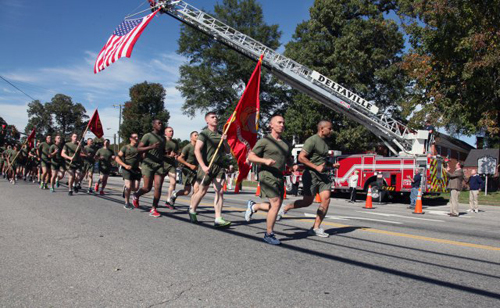 Each year, the Fort Lee detachment runs 66 miles from Fort Lee to Saluda to honor Marine Corps legend Lieutenant General Lewis "Chesty" Puller at his final resting place at Christ Church cemetery.